Rev. Laurie O'Leary, our minister, grew up in Bothwell, Ontario, graduated from Fanshawe College with a Legal Office Administration diploma, and worked as a Legal Assistant for over 30 years. She became a member of the United Church of Canada in 1999, at Wesley-Knox United Church, London. Before entering ministry Rev. Laurie was a Licensed Lay Worship Leader, a graduate of the Middlesex Presbytery Lay School of Theology. After discernment for ministry, she began studies at the Atlantic School of Theology, Halifax, Nova Scotia through the summer distance education program. She graduated with her Master of Divinity and was ordained in May, 2013. 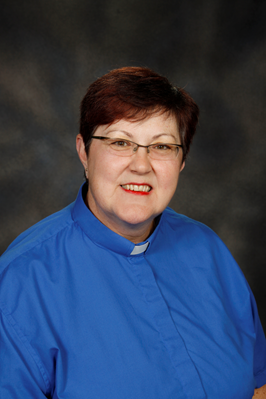 She has served the Southwold Pastoral Charge (Bethany United Church and Frome United Church) and the Mount Brydges Pastoral Charge (Cook's United Church and Mount Brydges United Church). She is also involved in committee work in Huron-Perth Presbytery and London Conference. Rev. Laurie's ministry with Exeter United Church began February 1, 2016. She is passionate about ministry that allows her the opportunity to engage with a variety of people and ages. Creating liturgy that is meaningful, engaging, and inclusive sparks her imagination! Rev. Laurie and her husband, Mike, have three adult children and three grandsons. Laurie loves to laugh, enjoy family time, knit, and garden when the opportunities arise. She is excited to be a small part of our motivating vision - Open Arms, Open Hearts, Open Spirit. Our church Treasurer, Lynn Alderdice,​ keeps us on track financially and provides a balanced perspective. She has many years of financial experience and expertise from her previous positions in banking and the non-profit sector. In addition to serving as Treasurer for two United Church congregations, Lynn works full-time at the Garlic Box in Hensall. Our church Custodian, Ann Lindenfield,​ is always working behind the scenes to ensure that our church building is welcoming and homey. Ready to welcome everyone with a smile and help out wherever needed, Ann embraces our vision of Open Arms, Open Hearts, Open Spirit. In her spare time Ann enjoys spending time with her family and her dogs.